A fellow paranormal investigator and I went to the residence of our next investigation to interview the owner. We had a fascinating discussion. Before we left the home, the owner brought out a photograph to show us. The she allowed us to take the photograph with us so it could be scanned and copies made. While most of the photo is underexposed and slightly blurry, there is no mistaking the child in the photograph. Now, the male child on the right in the photograph is present, but had a clean face. This was taken during Christmas and there were several family members present. However, the child with the most action and looking directly at the camera – was not there – for the photograph. No one in the family has ever known or seen this child. None of the people present saw the child in the room. I am posting this photograph so that we may get comments from other investigators. I am a professional photographer and have been so since 1973. The photograph did not appear to be tampered with and was developed by a retail store. I am looking for plenty of discussion on the photo. Can we get your opinion please? 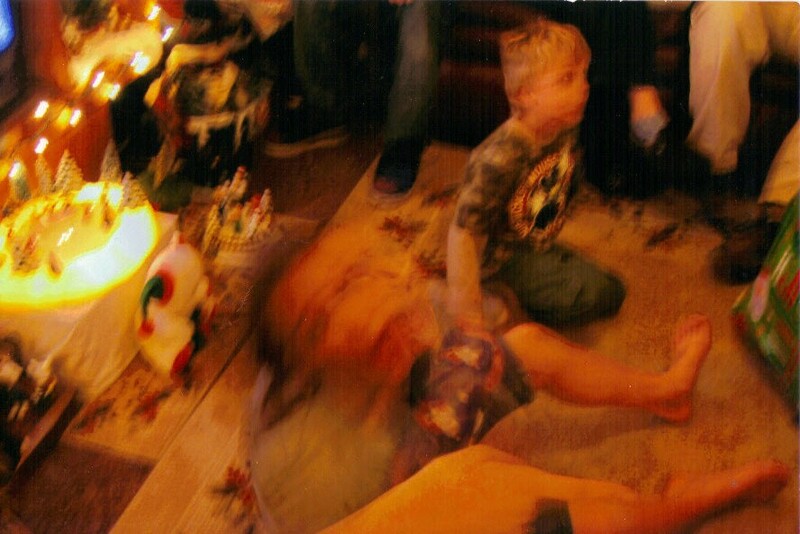 Looks like this was taken on a slow camera shutter speed, while everyone, but the child in question was moving slowly or still, and he was moving quickly. It was taken with a 35mm auto camera. The child moving was not in the room or seen by anyone present. The child is unknown to the family and now some family members will not come to the house. I am not a professional but I do have an opinion. I have been studying the paranormal since I was 11 independently. I am now 27 so I guess that gives me 16 years. The “child” in the photo looks to be a displaced soul. A child who passed to early who may not even know that he is gone. My guess would be though that the child does know that he is gone and is not willing to accept it. He is probably trying to keep himself attached to the living by attaching himself to this family. In most of the cases I have read about myself this is an innocent act, in the more unusual cases though, the child can become jealous of the parents love and affection for the actual child and through “tantrums” as a real child would but lash out with paranormal strikes rather than crying and pouting. Then again he could identify more with the child and if the parents try to discipline the child or become abusive, he would try to defend his “brother” and/or “sister”. Again in paranormal strikes. This is simply my opinion take it or leave it.